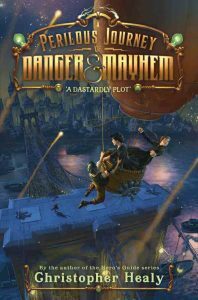 Christopher Healy: Chronicler of Heroic Shenanigans | Critics Love A Dastardy Plot! Critics Love A Dastardy Plot! It’s 1883—the Age of Invention! A time when great men like Thomas Edison, Alexander Graham Bell, Nikola Tesla, and George Eastman work to turn the country into a land of limitless opportunity. And it all happens at the world famous Inventor’s Guild headquarters in New York City—a place where a great idea, a lot of hard work, and a little bit of luck can find you rubbing elbows with these gods of industry who will usher humanity into the future. Unless, of course, you’re a woman. Molly Pepper, daughter of brilliant but unknown inventor Cassandra Pepper, lives with her mother in New York. By day, they make ends meet running a pickle shop; but by night, they toil and dream of Cassandra taking her place among the most famous inventors in America. In an attempt to find a way to exhibit Cass’s work at the World’s Fair, they break into the Inventor’s Guild, where they discover a mysterious plot to destroy New York. The evidence points to the involvement of one of the world’s most famous inventors, and now it’s up to Molly, Cassandra, and a shop hand named Emmett Lee to uncover the truth—even if no one will ever know it was they who did it. Buy it here, here, here, or at your favorite local bookseller!